After gaining of love for cooking at the age of 17, Scott decided to train professionally at Niagara College Canada in Niagara-On-The-Lake, and in 2013 became a graduate of the Culinary Arts Program. Originally from Kitchener, Ontario, Scott cites the unique and diverse food and wine scene as reasons for keeping him in the Niagara Region after college to explore his culinary career. 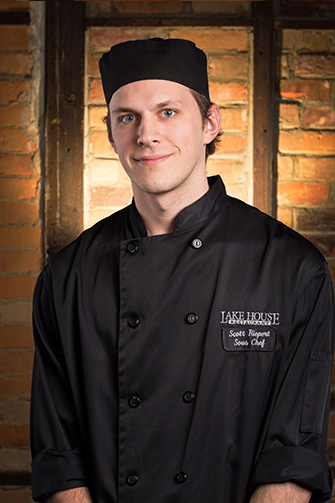 In 2014, Scott joined the Lake House team as a line cook and has since become Executive Sous Chef at Lake House Restaurant. Scott thrives working in a fast-paced environment. Scott enjoys learning new cooking techniques and continuously growing his skills in kitchen. On a recent trip to Southeast Asia, Scott explored his love of world cuisine visiting and sampling the local food in Vietnam, Thailand and Laos. It was an experience of a lifetime and Scott hopes to travel again in the future. Scott has hopes of running his own kitchen one day and in the meantime he is focusing on honing his skills and improving his culinary techniques.